When it comes to eating healthy we all have our ups and downs. Even the most fit and health conscious people admit to falling “off the wagon’ during the holiday season. But the good news is that you can just as easily get back on track by incorporating more healthy foods that will not only help you shed excess weight but also improve your health. Simply incorporate these “fat-burning” foods into your diet by substituting them for your normal “fattening” foods. These foods are healthy and low in calories which can be eaten all the time as part of a wholesome, plant-based diet. Quinoa – Although a seed, quinoa is considered a grain as it has a fluffy, creamy, slightly grainy texture and a somewhat nutty flavor when cooked. It is high in protein, including all nine essential amino acids. Part of the same family as spinach, quinoa is high in fiber and minerals such as magnesium, manganese, and iron. Lots of protein and fewer calories make this not only a great food choice for weight loss but also a great plant-based meat substitute! Oats – Oats are rich in fiber and complex carbohydrates which are needed to keep your metabolism up by keeping insulin levels low after a meal. Eating foods that lower insulin levels is helpful in loosing weight since insulin spikes make your body think it’s time to start storing the fat. Beans –Beans provide you with almost complete nutrition and are a great meat substitute. High in quality protein and rich in fiber, this a great diet food as it helps keep you feeling full longer and insulin levels low. Also low in fat, there are numerous types of beans to meet anyone’s fancy. So pick the ones you like and add them to your meals. Hot Chili Peppers – Such as jalapenos, habaneras, and cayenne…. hot peppers can help burn a few extra calories and a little more fat according to a recent 2010 study from the UCLA Center for Human Nutrition.1 Researchers led by Dr. David Heber, tested a compound related to the capsaicin found in hot peppers which suggests that heat generated by peppers can cause your body to burn more calories and "oxidize" layers of fat. This latest study follows other studies finding hot peppers may increase metabolism.2 Although it is not a magic bullet, these compounds work in support of a well-balanced diet. Apples – Apples are a great addition to your weight-loss plan for numerous reasons. Apples are rich in vitamins and minerals and low in fat and calories. They are also high in fiber which helps keep your stomach feeling satiated or full longer. Apples don’t shoot up insulin levels like some other fruits. Dark Leafy Green Vegetables – Super calcium-rich dark leafy greens including kale, spinach, romaine lettuce, chard, collard greens, etc. are ideal for helping weight loss. One of the key components to weight loss is increasing your metabolism rather than starving the body of calories, which slows down the metabolism and hangs on to energy—fat—more intensely.3 Studies have shown that high-calcium diets favor burning fat rather than storing it, mostly by speeding up metabolism.4 These green leaves are also high in weight loss-assisting vitamin C and fiber as well as a plethora of nutrients for good health. Broccoli – This super food is packed with nutrients including calcium, vitamin C, folic acid, vitamin A, fiber, cancer-fighting nutrients and even protein. This high-calcium food can contribute to weight loss for reasons mentioned previously and are full of antioxidants that provide a large number of health benefits including decreasing the risk of heart disease and certain cancers. Green Tea – Green tea contains a chemical called epigallo-catechin gallate or EGCG that causes the brain and nervous system to work faster and helps burn more calories. EGCG is also a powerful antioxidant which can help fight disease. Lemons – Lemons stimulate the body’s digestive system. Rich in citric acid, lemons work with other acids and enzymes for healthy and effective digestion by stimulating stomach juices.5 The acidity of lemon juice can improve your digestion and balance blood sugar levels from a meal. Try seasoning your meals with some lemon juice or having a little fresh lemon juice in water before a meal to boost your digestion. Proper digestion is important not only for weight loss but for overall health and longevity. Papaya – Papayas are rich in enzymes, making it another food that is good for digestive health. Papaya contains the enzyme papain which digests protein as well as other enzymes such as alpha amylase and protease to help break down starches, carbohydrates and protein. This is essential for weight loss and boosting metabolism. Losing excess weight and maintaining good health should be a gradual and practical process that becomes a habit rather than a phase. Make it a habit to choose healthy foods as much as possible and don’t worry if you have a “bad” day here and there, just fall back on your healthy eating habits. Replace animal products such as meat, chicken, fish, eggs, and whole fat dairy with whole grains, vegetables, and legumes. 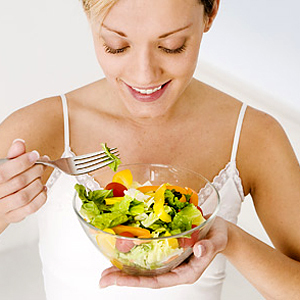 A low-fat, vegetarian diet is a great step toward arriving at and maintaining a healthy weight. If your meals are always abundant in fresh vegetables, fruits and whole grains, it is easy to avoid excess fat.